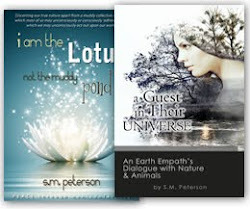 “Start with how beautiful all of creation is,” was the reply. It was not very long, however, before I felt distracted and lost my focus. As I sat by the river’s edge, three young mallard ducks (two males with one female) had paddled over to my side of the river. The female in the group began honking. “Is she looking for food?” my mind wondered. I must admit that I never really had an interest in ducks prior to living by a river. I had never before imagined that living by a river would be so inspirational in view of all the elements of nature that I could come in contact with. Now that I do live by a river, I have developed a love for watching the ducks and other waterfowl during the summer months. I have also noticed that through what I am observing, I am learning a lot about their habits and personalities. 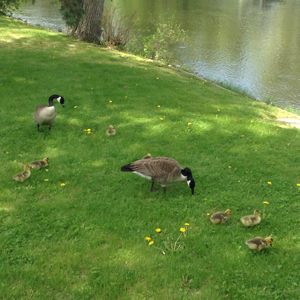 For instance, with the Canada geese, once their goslings are born, both parents can be seen raising them together. In fact, you rarely see a group of goslings without two adults traveling with them everywhere they go. However, when it comes to male and female mallards, while you can often observe them coupled up in the springtime, as soon as the ducklings are born, the couples seem to separate. 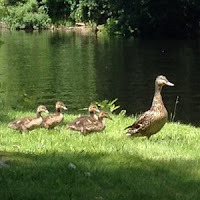 During this nesting period, the mother ducks can be observed on the river with their young ducklings following behind them everywhere they go. The males seem to be nowhere to be found, or so I thought. After a little research, I learned that the drakes (the male mallards) go into an “eclipse” period when their plumage changes to more closely resemble that of the females. They also become more secretive for a period of time due to being temporarily flightless (and thus more vulnerable to predators). Now that the summer has begun to fade out and the ducklings have grown up, it is still hard to differentiate the males from the females since the males still haven’t come into their colorful plumage. The only way I can tell the males apart from the females is to focus on their beaks. Male mallards have larger yellow and/or olive beaks while the females have smaller orange and black beaks. These are the types of things I have learned from sitting by the river watching the ducks and other waterfowl during the summer. She immediately turned around and started quacking at me. As she quacked, the other two males also turned around, probably wanting to see what the fuss was about. Then a fourth male came to join the other three. 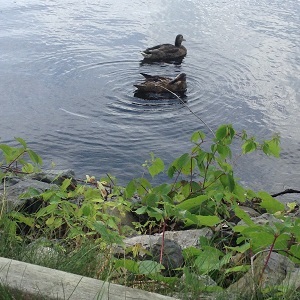 As I sat there having a conversation with the four ducks, a fifth duck started quacking from a dock across the river. Then a few of the ducks that were part of its pack got in the water and began to swim over. I felt amazed and awed by this experience. They all continued to paddle around in circles in front of me even though I had no food to offer. Soon, groups of ducks were approaching me from all different directions, and I kept talking to them, telling them how beautiful they were and apologizing that I had nothing to feed to them. 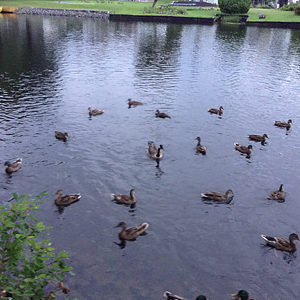 At this point, I counted seventeen ducks gathered in a group in front of me. My cat Cricket had also come to join me, seeming to want my attention (or, perhaps a little jealous?). She started rubbing her head against my legs and meowing at me until I grabbed her and plopped her on my lap so I could pet her. With all of the ducks gathered in front of me, and with Cricket and my notepad on my lap and my pen in hand, I decided I was going to try to communicate with them in the same way I was attempting to dialogue with Mother Nature. So, I closed my eyes, blanked my mind, and asked the ducks if they had anything to communicate to humanity as a whole during this time. “What can I help you with?” was the question I next posed. “Help us to restore the balance,” was the answer I wrote down. “What can I do to help with that?” I thought to myself. “What do you want me to receive?” I asked. While remaining in meditation, I kept flowing with what was coming through and writing it down. I had never thought of the phrase “honor thy mother and father” in this sense before. We typically think of honoring our biological parents when we hear this phrase. This interpretation seemed to give it new meaning. “Know that you are a blessing. Each of us is a blessing,” were the next two phrases I wrote down. I asked if there was anything else they wanted to communicate. This really made me think because as humans we tend to consider ourselves the highest animal on the totem pole in relation to the life around us. 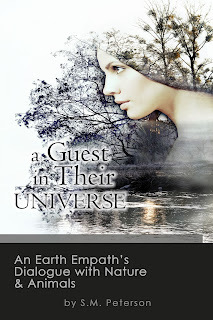 Here, the message I was receiving was that I was a “guest” in a greater universe. My mind then turned back to the original question I had asked Mother Nature and the answer that I had received: “Start with how beautiful all of creation is.” Everything I had experienced today on the riverbank had given me a glimpse of how beautiful and miraculous life and nature can be if we take the time to notice. All of this had given me a lot to think about. A few questions crept into my mind at the same time. The most prominent question was, “Would I be able to hold onto this feeling of appreciation for nature, or would I lose it all and return back to my everyday life as if what I experienced today never happened?” These were questions that only time would be able to answer for me. For now, I bid the ducks good-bye and thanked them for their company. With my cat Cricket following close behind, I went indoors for the evening.